Note: On February 2, 2017, students in Stephen Norris’s Spring 2017 Introduction to Russian Studies course engaged in a role-playing exercise that aimed to replicate the decision-making the Bolsheviks faced when they seized power in October 1917. One-hundred years after the momentous events of that year, Miami students placed themselves in the shoes of revolutionaries and then reflected on what that in-class exercise helped them learn about the Russian Revolution. Below are papers written by students in the class. By Addison Caruso, Adam Cloch, Chelsea Leipold, Katelyn Scheive, Nick Schleter, Mary Seaman, and Brad Terrace. It was a dark and cloudy day, and as the wind rustled all around me I knew it was time to plan a revolution. We had succeeded previously in toppling our autocratic Tsar, and the successor, an autocrat in all but name, Kerensky. The task for building a government was ours on this foreboding day, and it is a task that was to be done in the utmost urgency. Comrade Lenin appointed me to the security council, where I was to, in the face of enemies from everywhere, come up with a way to keep our new nation safe. As there were threats from all around us; the Whites, kulaks, and double agents within our own party, we had to proceed fast. We had a mere forty-five minutes to come up with a plan to protect this government of the proletariat from its enemies. Luckily this was not a barrier for us. Through sheer will and compromise we were able to reach a decision that all were proud of. In my committee, there were two personalities that were prominent, mine and comrade August. He is a wise and well-read Bolshevik but his ideas of violence are abhorrent to me. I was taught very young about the French Revolution and the reign of terror that followed it. The number of people killed in the name of freedom and liberty is staggering, and something that must not be repeated. I believe a revolution can happen without the shedding of blood. He disagreed. It was hard to reach an agreement given our strong personal beliefs. He shared with me his hatred of the bourgeoisie, as his father had been killed by his landlord when their rent was behind due to a bad harvest that was happening. Despite this we managed to reach an agreement that violence would be used only as a last resort. I guess a little violence is better than no violence. The other two comrades in my committee were not so forceful, and once me and comrade August agreed on a solution, the other two members were happy to follow along. As a fervent Bolshevik, I have read many of comrade Lenin’s and Trotsky’s writings and treatises. One of the writing’s that inspired me in this endeavor was Lenin’s speech describing the three components of Marxism. His talk of the class struggle and how the new revolution must bring the proletariat into power, caused me to think how we would design a justice system based on this. I decided on a court system based on class, where the proletariat would have the power in tribunals and we would rid ourselves of the bourgeoisie excesses that exist. We also decided that we must rid ourselves of the ruling class who refuse to commit to this new order. While this does sound harsh, as comrade Lenin said, we must destroy the old order to build a new one, and no single victory of political freedom was won without struggle by the capitalist classes. We knew that the old order would resist, but I advocated for letting them declare their support for the revolution. I always support the olive branch over the sword, and it is this idea that I tried to impart on the committee. After we had decided on a solution I felt relieved. We had solved one of the central problems plaguing Russia. A hundred years from now as students reenact this glorious day, I do hope they can grasp the pressures that we were put under and understand that while our decisions might not have been the ideological ones, we were under tremendous pressure to keep our new government safe from harm. With enemies, all around you it can be hard not to resort to violence, this temptation is there, but to those that want to give into this temptation, I caution restraint as I did during our meeting. Violence only leads to more violence, only through offering reconciliation and a chance to be a part of this new Russia, can we make this socialist utopia we have all dreamed of, a reality. Comrades, as we look back on our last meeting we must remember to proceed with great haste. Time is of the essence if we are to implement our ideas for our glorious revolution. We met and discussed for only a short amount of time, but we accomplished much, especially in our group on economics. Comrades Mohinee, Madison, and Abby all worked diligently to come to our conclusions, but they did not come without great argument and uncertainty. Lenin should also be proud of the work of his we have followed as laid out in his April Theses only five months ago. As we look back on the meeting we have just finished, we must understand that our findings fall in line with what other comrades of ours who have discussed and that moving forward we make haste to ensure our economic goals are successful. The matter of discussion only being 45 minutes long was a great constraint and burden felt within our group. In order to accomplish the most we could, egos and nonconformist ideas had to be left outside. It was of extreme importance that we had only those in our group that wanted the revolution to succeed and no bourgeoisie spies in the mix. Comrade Mohinee and I had very good discussion on what our goals should be within economics and in doing so, we knew beforehand each other’s biases. I believed, and still believe, that our revolution should happen within the quickest time-frame possible, while Mohinee at first wanted to take a more gradual approach. If I had not understood this beforehand, I would have thought of her as a spy from the wretched bourgeois. I found my job to be persuading my other two comrades, Madison and Abby that my way was the correct one for changing the economy. Our ultimate conclusions follow Lenin’s plan as laid out in the April Theses including the nationalization of all lands and the seizure of banks so they fall under one collective controlled by the Soviet of Workers Deputies. Our work also follows true on the words of the interpretation of Marx, by Lenin, who talked greatly about the need for workers to understand their position and rise up together. Our plan entails the seizure of the factories and fields by the proletariat and peasants in unison to take back what they deserve from their own labors. As this will be a very rapid turn of events the original job is to be carried out under the watch of the local Soviets, but power will be transferred to a central group of Soviets where we can decide our best course of action within one month. As I compare the work that my economic group has accomplished compared to others in the party I believe that we can learn much from each other in our short amount of time. One of the biggest points that effected our decision making, besides time, was the biases that were known in our group. As I said earlier, not knowing that Mohinee wished to take a slower approach, one that curtailed no use of violence and the use of elections before seizures, I would have thought of her as a spy. Since I did know that she was on the revolutionary side, I did not call for her execution for her actions. We should, however, remain vigilant to combat any bourgeois infiltration and proposals. Besides the economic outlook, the groups on executive power and state security had similar, radical ideas to our own. I believe that together, and with considering other factors we can all work together to accomplish the goals of the revolution. Also, the use of the writings by Comrade Lenin proved to be very useful as well as the understanding in the lead up to the events that led us to our meeting in October. I believe some members on economics may have forgotten some details of where we stood since we had seized power before our meetings. It felt as if I spent a lot of time convincing some of my other party members that it was time to move forward with her revolutionary ideas and not get hung up on saying it is what we should do once we had seized the power. The next coming days and months will tell us if our revolution is successful or not. As we look back on the decisions we have made and if they are carried out effectively I am confident that we will continue to see the rise of the proletariat not only in our glorious Russia, but across Europe and the rest of the world. Coming into the role-playing exercise, I was unsure what to expect. The day before, I had gotten an email giving me a side to take and argue to my group. In the Nationalities Committee, I was to convince my group that the Bolshevik state should reconstitute the Russian Empire and oppose any efforts to declare independence. After doing the readings in preparation, I found that Lenin had a viewpoint separate from the stance I was to take. I tried to pick out short quotes that, out of context, would support my argument. I also hoped that some of my group members would come to class having not read the assigned Lenin writings, or wouldn’t have strong opinions on the matter, and thus go along with whatever I said. I walked into class determined to carry out my mission of reconstituting the Russian Empire. It quickly became apparent that my fellow committee members had read Lenin’s writings, and that I had my work cut out for me. Through our discussion, it was clear that some favored letting the repressed nationalities declare independence, while another was leaning towards my own side of keeping the nationalities on a tighter leash. After some debate and referencing Lenin’s works, we reached a compromise, which was essentially what Lenin had proposed and discussed. As a Nationalities Committee, we proposed what was essentially a veiled independence. We decided that each formerly repressed nationality should be given the option to declare independence, however going along with that, the Bolshevik state should remain incredibly close to this newly formed, independent nation in order to keep them in check. More importantly, there would be a push to ensure that all nationalities see themselves as the proletariat as their main identity, as discussed by the Russian Social Democratic Labor Party in their Resolution on the Nationalities Question. The hope is that they identify more as a class than a nationality, therefore uniting all of the workers in our newly formed socialist state. 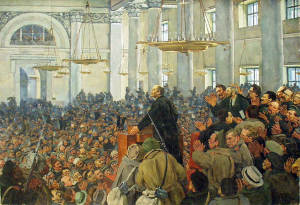 Lenin says in his Resolution on the National Question, “Only the merging of various nationalities… will make it possible for the proletariat to wage a successful struggle against international Capital and bourgeois nationalism.” It is essential that all of the nationalities come together as a working class so that socialism can take hold. While we did compromise relatively easily, as neither side was very aggressive in getting their own way, I did push for the loyalty to the working class, as well as to the new Bolshevik state. I made sure that the committee was clear that it was pseudo independence, only used to achieve unity among the working classes. I think had our group been composed of individuals with larger, possibly more stubborn, personalities, compromise would have been much more difficult. I imagine that during 1917 this would have been the case. Prominent figures would have duked it out more often than they sat down, talked it out, and eventually reach an agreement. This is what seemed to have happened in several of the other committees during the exercise. Under the pressure of having a country dropped in your lap in need of a new government, I could imagine individuals getting very stressed, and not everyone reacts positively to such situations. I picture tensions running high and many arguments taking place, which again, was not the case in my group. I would say that as a whole, my committee was probably not as representative of what happened in 1917 as some of the others. Filled with calm and levelheaded committee members with willingness to compromise, we drafted a proposal supported by the works of Lenin in which everyone, including formerly repressed nationalities got something that they wanted. In preparing for the cultural committee, I read the listed key document and Lenin’s cultural speech on the Marxist website that was given before the Revolution. As a group, we tended to agree that we should use propaganda but struggled to figure out whether we should use any forms of the traditional culture. We also focused much of our discussion on how to implement these policies across the Soviet Union. We decided to use traditional cultural forms and propaganda focused on the proletariat. The time restrictions, given preferences, and different personalities in each committee helped to reflect the certain conditions of the Russian Revolution, but I have a few ideas in how these factors could be improved to more closely resemble the actual committees. The time restrictions placed on us helped me to understand how quickly and challenging it was to put untested theories into practice. According to scholar Stephen Smith, the restlessness of the people and risk of threat of foreign intervention affected the committee’s urgency. Fast decisions were necessary, which didn’t allow for much debate (Smith, 67). We discussed at great length how we should implement our cultural policies in a timely manner so that the culture would reflect the changes the revolution was trying to make. We wanted to use radio, posters on buildings, art, and the educational system to bring about the new culture focused on the proletariat. We did not focus on the ethical implications of our ideas; we simply wanted to get a solid plan in place that could dictate how the policy would be carried out. We lost the luxury of in-depth debate and democracy, as the real committees did. The time restrictions and other constraints could be adjusted to reflect the changing atmosphere of committees. In 1921, factions were ‘temporarily’ banned, but this was never changed (Smith, 68). This activity could reflect the reduced dissent by giving more time to work on plans of execution after presenting our views to the class, but telling us we couldn’t change our ideas from our original plan. You could also email or give a note to one of the participants telling them that anyone who debates the in-place ideas are bourgeoisie or anti-revolutionary. The given preferences reflected the many conflicting ideas on how the ideals of Marx should be carried out that the class as a whole new little about. Even though this was only a simulation, the given preference gave me a starting base for research and helped form a strong opinion for what we should do as a committee. I do think there are additional ways to reflect the motivation of the committee. For example, Stalin rose to power through his strong opinions in committees. More power and higher rank were very real rewards for doing well in committees. In this activity, the emails could say that if their idea is agreed upon by the committee, they’d receive candy or extra credit. This would strengthen our given preferences and help reflect people’s motivations and intentions in the committees in 1917. This activity helped me to understand much more the power of personalities in the committees at the time. Clearly, in hindsight, the ideals of the revolution were not carried out through the committees. In the very limited time that was available, people relied upon their confidence and persuasion abilities, like Stalin. For example, he argued “self determination should be exercised only by the laboring classes, and not by the bourgeoisie” (Smith, 55). Decisions were often based on “pragmatic abilities” when there was not a clear decision (Smith, 55). In my group, another person and I tended to disagree based on our preferences. The other person tended to be more firm and ‘louder.’ And since she was the one who presented our ideas to the class, she focused on the topics she thought were most important. I think our existing differences in personality easily reflected the individual differences in 1917. In both cases, strong and persuasive personalities tended to have their opinions reflected more in policy. This activity helped me most realize the critical effect of the limited time frame, the differing positions based on Marx theories, and the power of personalities in discussion. October 1917 could have resulted in many different outcomes in a communist government. The simulation helped demonstrate how the ideals of the theories were sometimes lost in committees and lead to the dictatorial communist government that existed for decades. In American history, it is often taught that one of the reasons we were victorious in the Revolutionary War was that we fought harder. We fought harder because we were defending our own land and believed deeply in our cause. Before it happened, it was idealistic – thinking 13 colonies subject to the most powerful king on earth could rebel and win to become the land of the free. Going through the activity of building a revolution of my own, it put into perspective just how much idealism was required for the Bolsheviks to have succeeded in building a revolution. As late as spring 1917, no logical person could have argued that the Bolsheviks would be able to take over the government. But logic is not revolutionary. Suspension of disbelief is revolutionary. Going into the activity, we were assigned to read Lenin, Lenin, and Lenin. A well-informed decision draws evidence from multiple sources but not if the ideas of Lenin and Marx are the absolute truth without room for interpretation. The revolution could not have carried on upon the will of one man if that one man did not believe unconditionally. Any shred of doubt would have derailed the entire operation. By trying for a short 45 minutes to replicate this fervor, it became clear that it was impossible to think it. The revolutionary spirit must be felt, and that is why our proposal would not have stood up to light scrutiny. Using the sources, we knew that strikes must be abolished, markets must be closed, currency and ownership of property must cease, and the war must be ended. However, each suggestion was met with a scoff or a discussion of how impossible it would be to implement. As students taught capitalism and its flaws from birth, we were incapable of the idealism required to set such lofty goals. Our proposed timeline was vague and our big questions were merely touched on. Part of this was due to time constraints, but another part was because of an underlying unwillingness to entertain such a fantasy. Without ‘pure’ ideals, the effort and focus required to answer such important questions in such a condensed timeframe was absent. Lenin lacked nothing in the department of revolutionary spirit. In his work, An Open Letter to the Delegates of the All-Russian Congress of Peasants’ Deputies, he opens with “All the land must belong to the people. All the landed estates must be turned over to the peasants without compensation.” He says this confidently and treats it as a matter of fact. He continues “The dispute here is where or not the peasants in the local areas should take all the land at once…” His baseline is that land that had been in families for generations that collectively is worth millions upon millions of dollars should be stripped without compensation. The only question, to him, is whether or not it should happen overnight. There is no mention of possible upheaval or outrage. There is only a sense that right is right and right must be done. The most important sense, from my experience in the exercise, which Lenin and his fellow revolutionaries had was that the history progressed in stages and theirs was the next one up. From Imperialism, the Highest Stage of Capitalism Lenin writes “If it were necessary to give the briefest possible definition of imperialism we should have to say that imperialism is the monopoly stage of capitalism.” With the most important countries on earth using capitalism in some form or another, it is fair to state that history was in a capitalism stage. And with the globe divided up as it had been among the wealthy, it was believable that that capitalism had evolved into imperialism. Additionally, the chaos and carnage surrounding the Great War enhanced one’s ability to believe that history was on the precipice of change. The relatively stable geopolitical order today as well as the benefit of hindsight robbed our group of that belief. When making our decisions, it was not under the assumption that our proposal would be successful and mark the beginning of global socialist utopia. Many victors in battle have believed that God himself was on their side, and the Bolsheviks had a similarly powerful ideal that history itself was careening down the railroad tracks in their favor. The activity allowed me to see the faith required for the Bolsheviks to seek power, let alone obtain it. Mary averted her eyes; he did have a point. She wasn’t even sure if she would have brought up the French Revolution during the discussion if Dr. Norris hadn’t emailed her beforehand, and, if she hadn’t advocated for that, the group would’ve enacted a policy of extreme prejudice against any dissidents. Still though, it was the only historical event remotely precedent to the Russian Revolution at that time – how could it not be relevant? And with that, Trotsky disappeared. Mary blinked at the place he’d just stood with a mixture of confusion and horror. She shook her head and opened her laptop to finish her essay, I’m never drinking Red Bull again. Anytime that the text is underlined, it is a direct quote from the Trotsky reading – albeit, some of them are out of order. Transporting myself from 2017 back to 1917 helped me to understand the circumstances surrounding the revolution and also allowed me to take on a new role as Vladimir Lenin. When I received the email from Dr. Norris, I recognized that he wanted me to take on the role of Vladimir Lenin in my group, a role that I was excited, but also a role with huge responsibility. Ultimately, I was able to convince my group to make the decrees that I was instructed to do in the email. Although I wish I was able to take full responsibility and brag about a superior intelligence, there were factors that I will discuss that I believe contributed to my success. At the end of the day, I believe that I had a much greater understanding of the crucial events of 1917 that would send shock waves through the world. The first factor that influenced my success in my group was comrade Aleah informing the group that she received an email from Dr. Norris, a fact that I kept secret. Once I knew that comrade Aleah was the “poison” of the group, but didn’t fully believe her argument, I started pointing out passages and quotes from Lenin to sway the group. In the April Thesis, Lenin of course states his opposition to the provisional government in #3, but more importantly for our group, he argued that a return to a parliamentary government would be a retrograde step in #5. Right as we were discussing this point, Dr. Norris handed a secret note to comrade Danny and immediately Danny switched his attitude from a casual supporter of the argument to an ardent supporter of my argument. With Danny and I both arguing the points, Tianyang and Aleah soon agreed that we should establish a dictatorship. Our next debate centered on whether or not we should allow other parties besides our own to participate in this dictatorship. Once again I turned to the Lenin readings because Lenin stated in From the Political Situation that “the aim of the insurrection can only be to transfer power to the proletariat… with a view to putting our Party program into effect.” Vladimir Lenin obviously believed that only Bolsheviks should rule; he did not trust other socialists because they could try to implement bourgeoisie policies. I conveyed this lack of trust to the group and with Danny so enthusiastically on my side, as well as the pressing time factor, the group decided that our Party would be the only party in power. I believe that the reason that I, Vladimir Lenin, was successful on both of my major objectives were my previous knowledge, comrade Aleah stating she received an email, and time. Beginning with time, we were able to rush comrade Aleah and pressure her into doing what we wanted because she was unable to think of alternatives to our plan that fit what she was supposed to argue. It also helped that the group knew what she was trying to argue since she revealed her secret about the email and her opposition to the points made her easily persuaded. Another factor, and the reason I was most excited to be Lenin, was taking POL 331 last semester gave me a lot of background information about the history of the Soviet Union and the policies of Lenin. I used this information to persuade Aleah further because I presented myself as an expert on the subject and the true positions of Lenin. Overall, transporting myself back to 1917 was educational and entertaining because it gave us an opportunity to feel what the Bolsheviks felt during that time. We could feel the passing of every second was important and the roles we played allowed us to understand the different arguments and personalities involved in the original process. Most importantly, I learned that in my specific situation, I would have made Lenin proud by achieving the things that he wanted and was able to achieve in 1917. As he was quoted in Smith, “Soviet socialist democracy is not incompatible with one-person management or dictatorship.” In Spring of 2017, Executive Committee Group B was able to put his writings into practice. All seven students were in HST 254, Introduction to Russian and Eurasian Studies.